The sunlight streams in through the massive stained glass window over the choir loft illuminating the blues and purples of the cross, the white and gray dove flying in the center. During the sunny days of the spring and summer months, a beam of sun comes through the skylight and finds me on my third pew from the back. The choir and people on the stage appear to have a “faded” filter until the sun moves further across the sky about ten minutes before the benediction. There is a rhythm to the service. One of the youth walks forward and lights the altar candles, opens the Bible, and then the choir proceeds in. They split at the foot of the altar, half going left around the pulpit, the other half going right around the lectern. We – the twenty to forty scattered in the pews, the half a dozen in the choir loft – sing mostly old hymns. We join together to say the Lord’s Prayer and after the ushers collect the offering we rise and sing the doxology. Another song and then someone reads a scripture from that week’s lectionary. We all call back, “Thanks be to God” as the reader closes the Bible with, “This is the word of the Lord.” After the sermon, the candles are snuffed and as we rise to sing the benediction response the smoke from the burnt out candles inevitably drifts towards me and I inhale a bit of it and cough out the last few bars of the song. When I was 17 I took my first plane ride to London, England with about a dozen other teens and a couple of adults from my church. We were going on a mission trip to work among refugees living in North London. That Sunday we went down to the magnificent St. Paul’s Cathedral. Built hundreds of years prior, the building was grand and impressive – filled with ornate stone and glass work. The missionary who was hosting our trip explaining to our Southern Baptist group that the service would likely be a bit different than we are used to, but to try and really pay attention to what was happening. I was a very assured 17 year old, confident in my beliefs. We arrived early and our group occupied the front row of the cathedral. I turned around to watch the procession of men in robes walking down the aisle – holding a cross and swinging a ball of incense. They sang in a language I did not understand and I found their short homily uninspired. I felt bad for them as they read through a call-and-response, certain that these often-repeated words could hold no meaning. When they called people forward for communion, I remained in my seat. I don’t remember if we were “allowed” to partake in this Anglican observance or not, but regardless I was not going because they used wine. And everyone knew Christians don’t drink. I squirmed in my seat; my assurances cracked ever so slightly that Sunday in London. I left my church about seven years later. It had slowly become a place that I didn’t fit. I left, slowly, and then definitively. For a few years – my life was fairly transient, so while I found churches to attend, I never settled too deeply into any church. Then I made a move that I knew was more permanent, or at least more long-term. A firm believer of the importance of the local church, I landed in the second-closest church to my front door. A church with the massive stained glass and the beautiful woodwork. A church where we say and sing some of the same words over and over and over again every single week. The one where the smells of candles literally take my breath away. Each week I am astounded at the way that I need to say, “Thy kingdom come, on earth as it is in heaven.” I need to say it out loud. I need to say it with community. I need to hear the excited voice of the children rising above the controlled tone of the adults. I need the moments of silence that come each week – moments that are sometimes punctuated by the rhythmic hiss of an oxygen tank, reminding me of the life in that room and the lineage of faith. 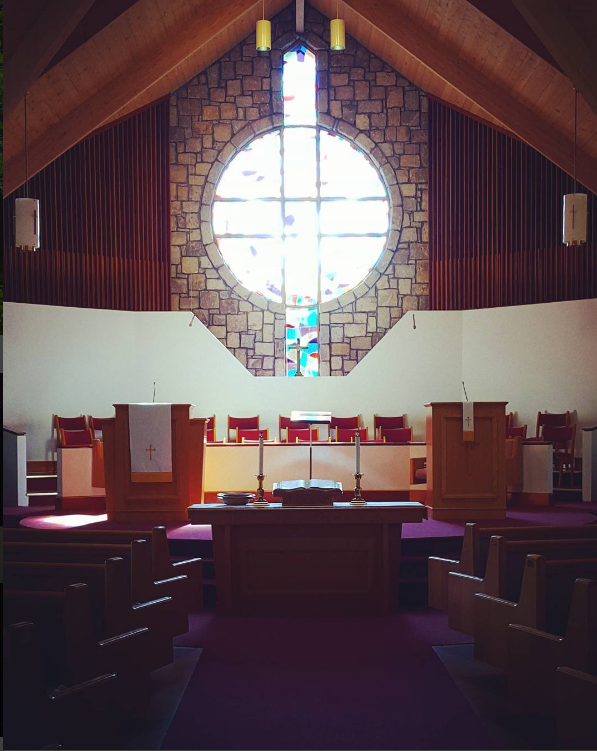 I need to stand and sing, “Praise God from whom all blessings flow” each and every single week as I stare at rows of empty pews in front of me. I need to remember these truths as I strive to live into doubts and questions. Almost 20 years after I rolled my eyes at the repetitive, smells and bells, of St. Paul’s Cathedral, I have learned that I need the smell of burnt-out-candle at the close of each service – an olfactory memory that triggers the acknowledgement that God is here, too. This entry was posted in Iconic Place and tagged change, church, iconic place, liturgy, sanctuary. Bookmark the permalink. Nicole, a big ole me too for this one! I chuckled at your responses to St. Paul’s Cathedral. I had similar thoughts about these Christian brothers and sisters, until I developed a holy jealousy for the depths of their worship experience. Your church sounds delightful! Glad I wasn’t the only overly-assured teenager. Ah – I sigh at that long-ago version of myself, but she meant well. and “holy jealousy” is exactly the right word. I can smell the candles and hear the bells when I read this. I have found that I need them, too. I love my church community but we are very contemporary. I have to make it out to the monastery or to a liturgical service before too much time passes though. I love the diversity of the way His people worship Him but have found the older I get, the more I need to SENSE Him. Beautiful words, Nicole!